Apologies for the lack of activity; I’ve got all of my posts saved as drafts, they are written out, but they need their correct images (Which I’m currently making smaller for upload). Anyhow… I’ve been doing a lot of research and considering around my previous subject question and while it is based on my love and fondness for Anime, I’ve come to the sudden decision of narrowing it down even further and solely focusing on a subject, that I’ve been interested in for years and it’s been quite a well spoken topic with in our Otaku community. The portrayal/depiction of femininity/females in Anime and manga, but I may just put this down to anime in general, due to the fact that I can tie this in to how they are visually and vocally conveyed as well. As someone who can be considered (or I consider) myself as an anime otaku (nerd/geek), but there was one thing I always noticed, and tried to avoid, which was the stereotypical, over the top feminine characters which pop up in a lot of Shoujo anime. You know, the girly girl who is always shy or embarrassed and depicted as weak and useless? Yeah, those ones. At first, when I tried to avoid this topic question, I could help, but ponder why they are often like that. Not ALL female characters are like that with in Japanese animation. Some are, but there’s either those types and the ones who are the stubborn, ‘I hate you, but I secretly love you’ types as well. This WAS NOT the only thing that came to mind, but there were so many things to bring up during this realisation. How the fans respond, or how over the years, this view on femininity with in japan has changed or has also reflected with in or through out these animations as well. Also, why, how and when they start to be seen or recognised like that? there’s plenty of other questions that are streaming through my thought process as of now, but these were simply a few that had hit me with in this. I did a bit of research over the past few days, and it does turn out that there’s a connection to Japans culture after all and good news! I have linked this thought process/question/subject back to the Gender roles essay which I wrote back in the first year. One of my items of choice which strongly depicts femininity (the Hello Kitty plush), I recited a finding from a book about how females of Japan are influenced in a particular way, and I’m curious to find out if this is due to the things around them, or tradition or even by their own choices. CCS: Essay// Notes- Development: Notes. I’ve had yet to talk about this or even mention it with in this blog, I wasn’t sure if I’m suppose to, but I wanted to share all of the neat discoveries I embarked upon while I was researching the topic of the Printing press. I’ve decided to focus my final essay on the subject of Luther and how his translations, and many different sources which were created with the press helped to challenge the church, in not just communication and mass spread of information, but how it dominated their manipulation towards the people with in German society of that time. At first, especially when it came to doing the case study, I was interested only in how a press operated and how it started off, but now I’m finding all of these interesting links and it’s left me with different questions to ask myself, so I wanted to share what I have so far. How did his press affect those who were using letter press before? how did everyone else with in society respond? what was the over all transformation? Focused on Luther and church. How did he come about and started to distribute, translate? How did the people take to this? what was they gaining ? what did they want from the people and were they controlling people the views? Why did luthers views change the people and challenge the church? what kind of people were interested and persuaded by the church and their views? What am I trying to state/reflect on this? what is it I want to say? How did the church manipulate these peoples views? Did anyone else get involved? What did Luther do in response to their dismissal? At the moment, I’m bulking up a lot of my draft notes and trying to form it in to a well-structured argument, but the only issue I’m probably having right now is with narrowing specific info down, so it’s clear. Punch was born from the inspiration of a live theater clown/actor from the Naples. The actor was called ‘Punchillo’. They came to Covent garden 1662 for Charles 2’s wedding(?). Punch’s personality, act, look and clothes was based on the actor/marionette. After the second world war, free punch and judy shows were given at weekends in the parks of the east end of London. children living in poverty were sometimes taken to the zoo or the beach on a day out, and a punch and Judy show would inevitable be included. To be quite frank, this information was useful to my studies, it confused me a little, and yet, the confusion was to be expected as I found myself to be skimming over the information in most of the books found. In spite of that, I have learnt quite a lot about Punch and how he’s created a tradition that could be considered as both ‘Modern’ and ‘Post modern’, but at the same time, I would of never thought that people would get so fussy over a puppet throwing his own wooden baby out of a window for their own entertainment. Also, apologies for those who have been waiting for an update to this particular subject; I’ve practically buried myself in my notes and research in order for me to find somewhat of a link between the object and it’s history. Carrying on with some research, I got down some notes for my chosen object. It took me a while to make a final decision from my four trips to three different museums, but I have made a final decision. I started off making a list of the things that stood out to me in the museum, which were the Japanese dolls (Bethnal green), Punch and Judy puppets (Bethnal green) and a Merry-go-round model (Bethnal green). I figured that there wasn’t any thing that stood out in the other two museums to me and I really was fond of a lot of things in the museum of childhood and I had to pick only one of these three; which led me to the puppets. At first, it would of been the merry-go-round, but after spending four hours of searching on Google for it, I couldn’t find an ounce of information about it. It was a huge disappointment and a waste of my time to put it bluntly. So, I went for Punch and Judy. Punch and Judy have a lot to talk about and could be something considered a treasure to British history, but there’s a problem, I can only talk about one of the puppets and I’m certain that I’ll discuss about the Punch puppet. He has a lot more to him compared to Judy because he’s the one in the show, that usually starts and ends the drama. 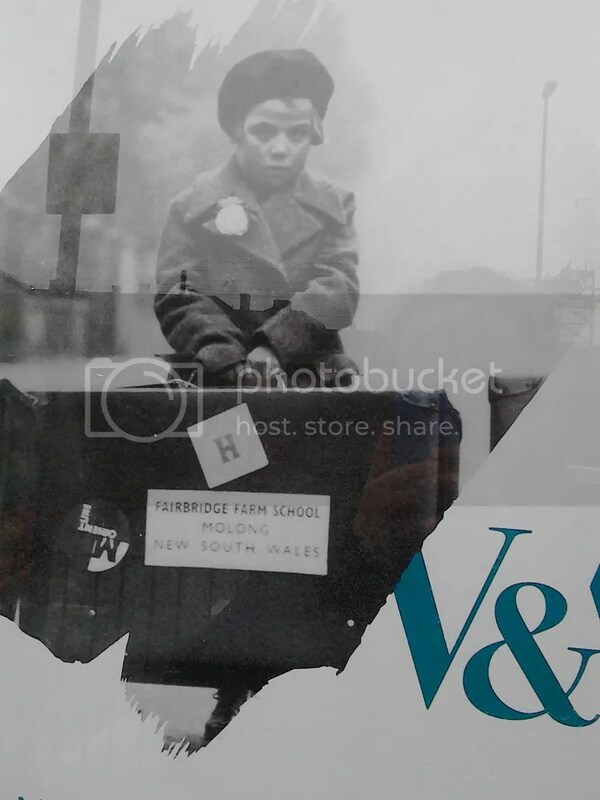 Quickly going to throw this exhibition out to everyone: On their own: Britain’s child migrants. Touching, but a small exhibition that highlights the time of when the British children migrated during the war. It features items that they kept with them, their stories of how they went through it and what happened and some photographs. It’s not an art related one, however, to find out some new, historical things from the people who experienced the huge tragedy may come in handy for any future projects. I originally attended this one in search for an object to talk about for my essay, but there wasn’t any that caught my eye. I also didn’t think there would be any further information on an item there, if I did find one.